This story is true and whether any of this adds up to anything, you can decide for yourself. Let me start out by saying, I don’t believe in magic or any afterlife. I am definitely an evolutionist that believes in the scientific theory of the creation of life. That said, I won’t rule out the possibility of some kind of creator that used evolution as its tool to spawn life on our planet. I must say though, that this story makes all of my scientific theories wobble a little bit in my mind. I got two new kittens in 1984. My first cat died of feline leukemia about six months previously. I always hated cats until then and had little patience for animals or humans. I’ve always said my first cat helped teach me how to treat other people better. We were heartbroken when he died. It was one of the first times I lost something I personally cared so much for. My father had passed away the year before and of course, it had affected me in a similar manner. We were waiting on a new kitten from someone that my wife Jill knew. It still hadn’t been weaned yet, but we just couldn’t wait any longer. We went into a pet store in a Columbus, Ohio shopping mall, and found they had only one kitten left. It was already getting a little big and had probably been there for a while. It was a black long haired cat. It was so beautiful that I bought it immediately. The clerk said it was a female and had all of its shots. We took her home and for some reason named her “Amy”. A few weeks later the other kitten was ready to come home. It was also a black female cat, except with short hair. She was easy to name as she went around the house crying , “Mao, Mao, Mao”. So I named her China. They were so fun to watch. China was so much smaller than “Amy”. It was funny to watch them play together. I wish I had a camera back then, because I have no photos of either kitten at that age. A few weeks later, Jill took “Amy” to the veterinarian. When she returned, she had some startling news. The vet told her that “Amy” was really an “Amos”. We had just trusted the pet store and because the kitten’s hair was so long, I had never noticed it had little boy parts instead of little girl parts. I did not think Amos was a very good name and decided that I would name him “Boy”. Boy was a fairly large cat after he grew up that was always the master of his own domain. He just tolerated most people, but always treated me with deep affection. I’ve always felt that most male cats were more attracted to people that gave them space and didn’t treat them like babies. Boy always followed me around the house. He sat at the computer with me. He would sit beside me on the couch. He loved me as much as I did him. But he had a streak of wildness that was usually initiated by trying to get him to do something he didn’t want to do. Brushing his long hair, giving him a bath, or taking him to the vet was always bound to draw blood from someone, even me. Once we took Boy to the vet for a minor procedure. When we picked him up, the vet’s staff told us that even though they had sedated him they were too scared to do the procedure as he growled at them fiercely even while he was unconscious. 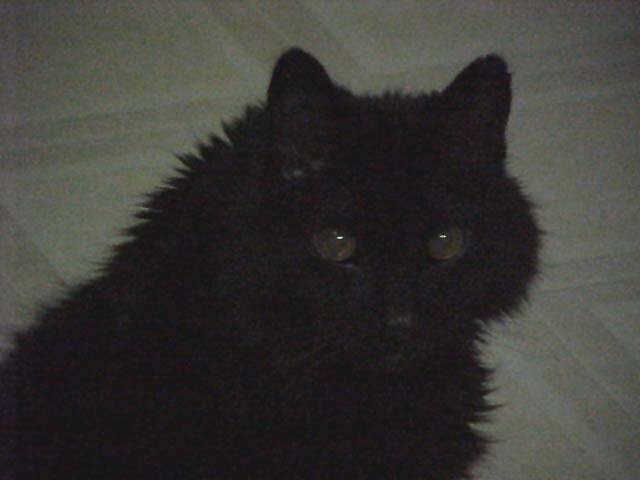 We lost China at ten years old to an illness, but Boy lived on to the age of sixteen. He had a stroke when he was about fifteen, but recovered. Later his kidneys began to fail. He became sicker and by July 2000 the end was very near.